While Apple TV is hands down the best media streaming option out there, streaming is not the only thing it’s good at. Thanks to the tvOS, there are many other cool things you an do with your Apple TV. 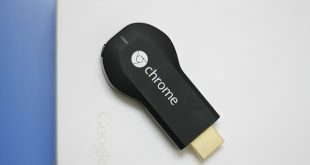 Like, listening to Podcast, Watching News, or even streaming videos stored in your Google drive. Note: In this article, we are not including the popular apps like Netflix, Amazon prime or any games. Instead, we’ll cover only the little known yet best free Apple TV apps to get the most of your tvOS. Let’s being. 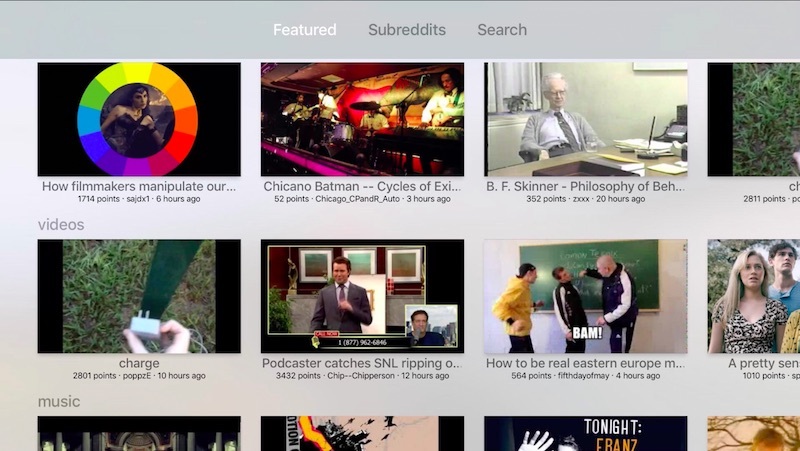 Want to watch the videos from Reddit on your Apple TV? Well then, BingeWatch for Reddit is what you need. On the home page, it shows you the most popular videos that are trending on Reddit or you can surf through the sub-reddits directly. My favorite feature though has to be the autoplay option, that makes for a true binge watching experience. You can also search a Sub-Reddit or a video via the search option which is already integrated therein becoming more helpful and quick with the voice command option on the AppleTV remote. And for all those who are thinking, yes, the app is family friendly, as one has to logged in to watch 18+ videos. Instead of Reddit videos, what if you want to stream an old video which is lying somewhere in the cobwebs of one of your cloud storage? You guessed it, that’s where Easy cloud player comes in. As the name suggests is the app that lets you access your cloud storage’s on your Apple TV. So, far we have logged into Dropbox and Google drive and were able to watch video files of .mov format. 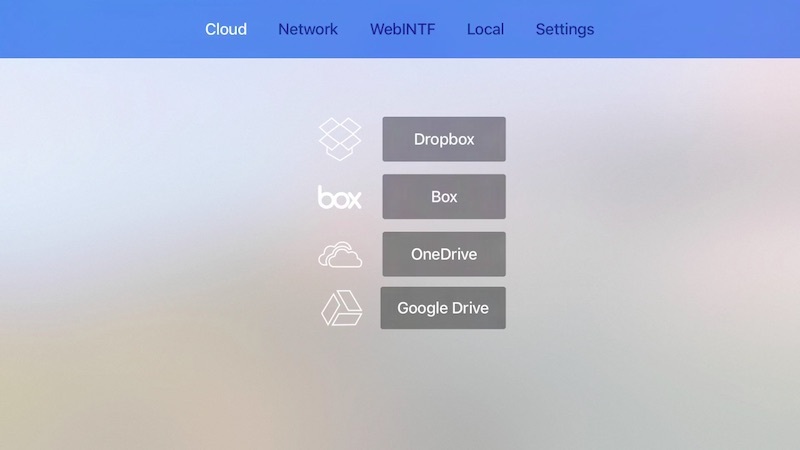 Cloud Player for Dropbox has other features like Network Streaming via URL, WebINTF or Remote Playback and Local Server access if your devices are connected to the same network. These services are free of charge and can be accessed directly. Overall, there is no way to access internet on Apple TV. So, if want to watch some private videos on your Apple TV, that are on the internet,you know where to go. After a tenacious search for a good weather app, I’m happy to say that forecast bar is only one that I’m satisfied with. While the app will cost you $4, what makes it stand-out from the rest is the fact that you can set it on Apple TV’s home screen. All you have to do is place the application in the first row, and it’ll gives you a glimpse at the weather forecast for your most recently viewed locations without even opening it. 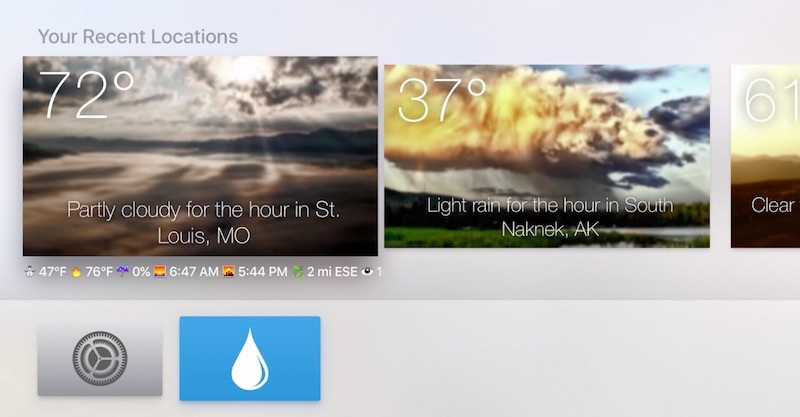 Meaning, you can just turn on your Apple TV and leave it be while still see weather updates right on your home screen. It also shows current temperature and conditions, plus the day’s high, low, chance of precipitation and of course future forecast when you open the app. While there are numerous ways to check internet speed on your smartphones and PCs, people don’t usually bother doing on Apple TV. Well, that’s where Speed test by ookla comes in. I’m pretty sure, you have already use their website. And, as you have guess it, you get the same experience on your apple TV as well. Just open the application and click on ‘go’ to know the upload and download speed of internet connection. We personally faced issues with the wifi signal when we first set up the apple tv for the first time ,so this might come in handy when you want to find out, if the internet issue is from ISP or due to low Wi-Fi Signal strength. 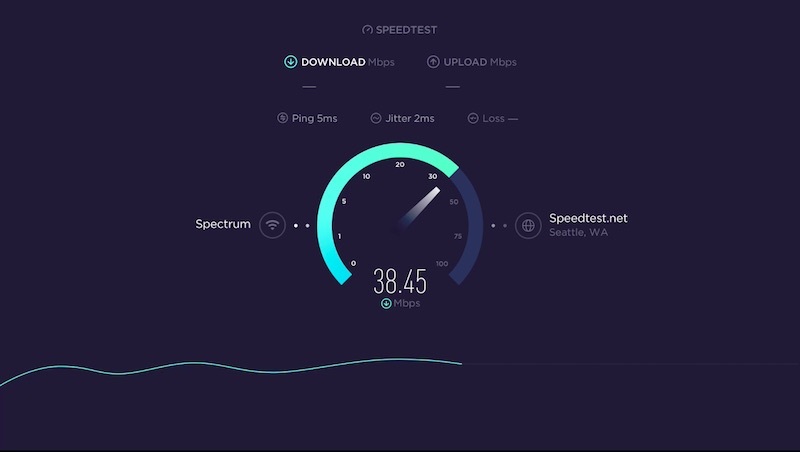 A good way to judge is by running a speed test both on WiFi and also by connecting the Apple tv with the ethernet cable, if there is huge difference in speed, it’s better to change your router’s position. .
As the name suggest the app is a mixture of music and podcast. The best part of about the app is that it lets you create your own personalized radio that includes podcasts, radio shows and mix tapes. While their music selection doesn’t include top singers, it does include indie songs from popular genre like dubstep, classic etc. Overall, Mixcloud is for people who are like to listen to their favorite podcast or music on the bigger screen. Having the comfort of seamlessly listening to your Audiobooks on Apple TV makes for a laid back experience. Well, Apple TV has most of the Audiobooks . The app lets you listen your favorite books while you don’t even have pay attention towards the TV, or even better, through its audio playback option you can hear a book while you are surfing through any other application which does not has a playback sound. 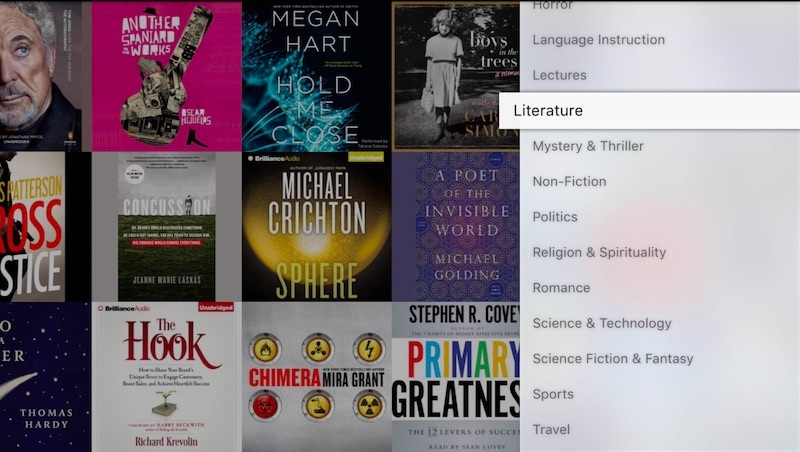 The Audiobooks app currently has two modes, you can either subscribe to their paid plan to enjoy all the latest Audiobook or simply browse through the free books section (it includes classics like Sherlock Holmes, and others that are the under public domain. I personally, use Audible for my Audiobook needs, so subscribing to another service is not for me. It would be awesome, if we can get Audible app for Apple TV, but until then, Audiobooks will do, well at least the free section. Overall, if you are like me, who always likes to be efficient, then definitely give Audiobooks a try. If you are news person but don’t get enough time to catch up with the what’s going around you, then Reuters TV is a must have application for you. It has a collection of news videos from around the world. 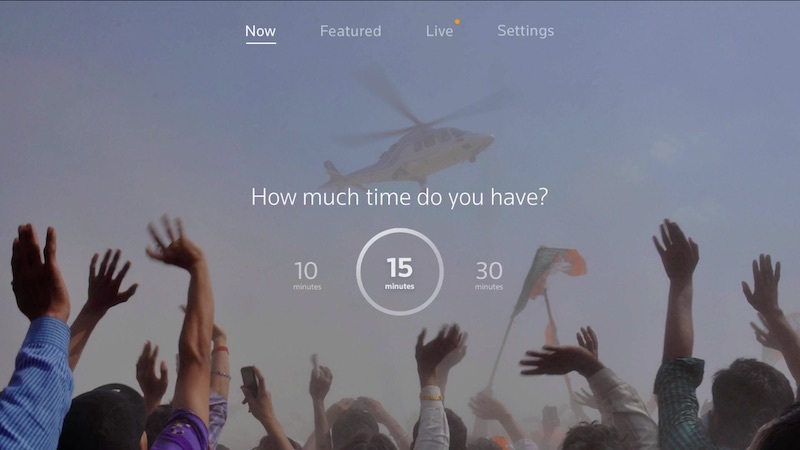 Once you open the app, it asks you about how much time can you spend on the news currently (like 10, 15, or 20 mins). Select one of them and it’ll automatically start playing the most important news of your taste. Based on your input it automatically collects the major headlines and takes you through it. Or if you rather have all the time in the world, simply scroll up to the featured section or the live section to browse through a plenty of more options. Overall, the app can help you to form a habit of watching news everyday, while you are getting ready for office or something. Whats that? 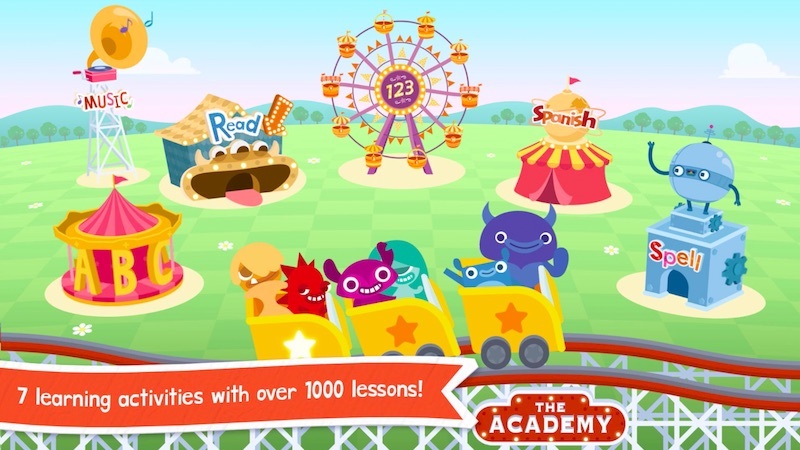 Enough with productivity apps, if you happen to have a kid at home, try Endless Learning academy. The application is suited for children, 4 years and above. It has interactive learning activities like Alphabets, Counting, spelling, vocabulary, reading exercises and much more. What’s different about it from other similar apps is that it has some practical exercises to learn about shapes and sizes, basic human anatomy and other exciting learning stuff. While most of the sessions are usually free, to unlock more you’ll have to make in-app purchase. A full version although is a pretty expensive affair, coming at around $90 as a onetime purchase, but if a kid is learning something, well it’s a small amount to pay. Give it a go and see if your kids like it. Links to all apps will be in the description below. There are two things that stop adults from being fit – not enough time and expensive fitness clubs Well, Yoga Studio might fix the issue for you. While I’m no Yoga expert, I wouldn’t rate this application better than a personal trainer, but it’s pretty good for every level of learning, if you are new at this. Ability: which has preset training sessions. Duration: which offers to choose a training programme/tutorial according to the time you want to spend on yoga. Yoga studio app on Apple TV wont let you sync with your calendar unlike on iPad or iPhone but comes with its own benefits of being on a bigger screen. The app initially offers free download but is eventually to be purchased for a monthly or yearly subscription of $2 and $20 respectively. Finally, my favourite one on the list. For all those who feel stressed after a busy day at work, well, ZenMixer is here to relax you, Don’t get too excited it’s just an app not your personal masseuse. 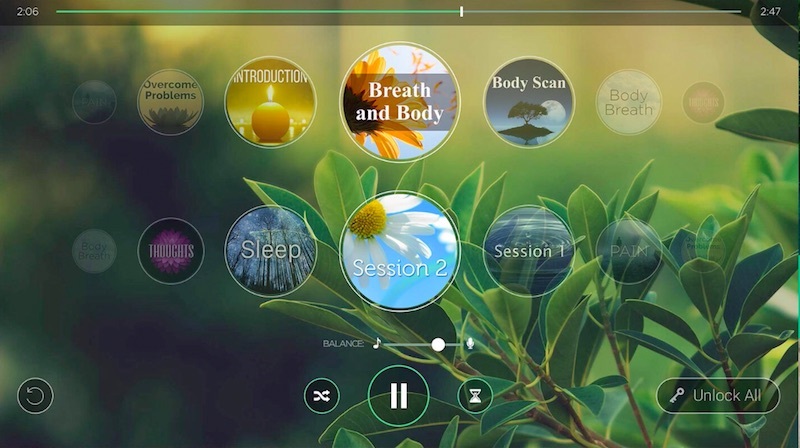 The app comes with handful of meditation music and guided relaxation sessions. 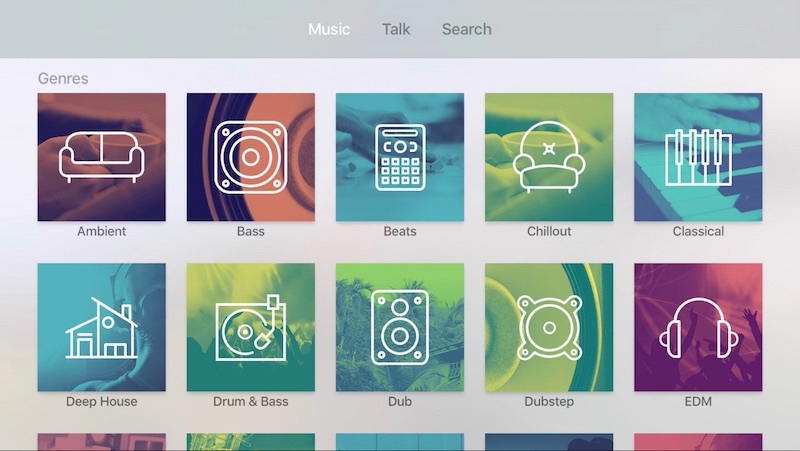 Zen Mixer has a basic user interface that makes you choose your meditation/relaxing music from a wide range of lists right at your home screen. Although the mediation music is free throughout but for the voice guided relaxation sessions you’ll have to pay a subscription fee after 3 stages starting at $10. The one quality that makes this one a better from others is it can track your heart rate, sleep analysis other readings via apple watch or other compatible health bands that can record data to the health kit app. It uses this data to give you personalized sessions, as claimed by the developer. Admired of fine art? 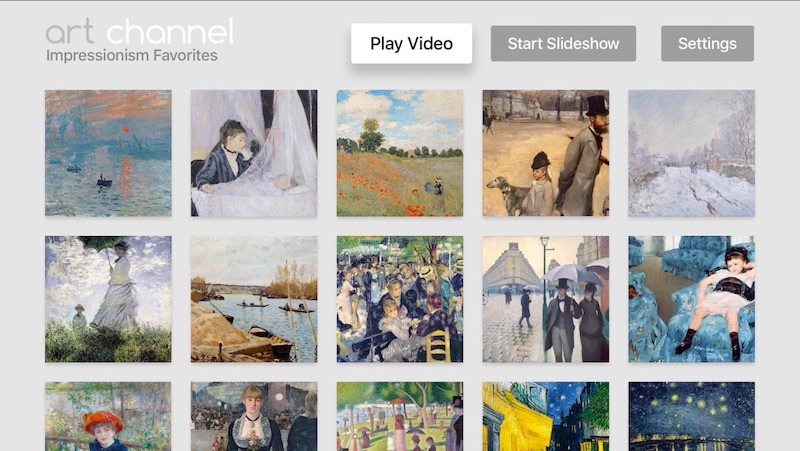 Want to have art museum in your living room? Well, with Art Channel you can do that. 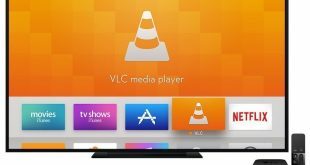 Sling- the popular app on your Android and iOS is now available on Apple TV as well. However. it’s not just the existing mobile app modified for the big screen, instead adds an entirely new interface. 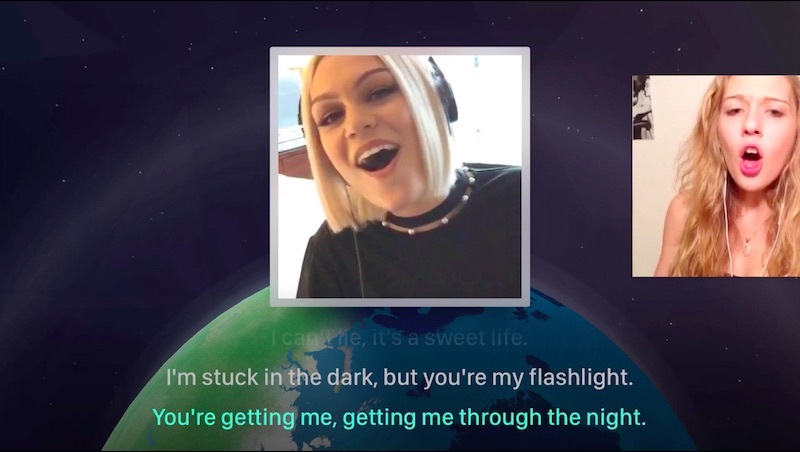 If you don’t have anyone to sing along with, then you can find someone from the Smule community to sing with. The best thing about the app is the fact that you can use your iPhone as a mic. Simply download Sing for the iPhone and connect it to your Apple TV over Wi-Fi. The app contains more than 100,000 songs, so everyone have something to sing along with. 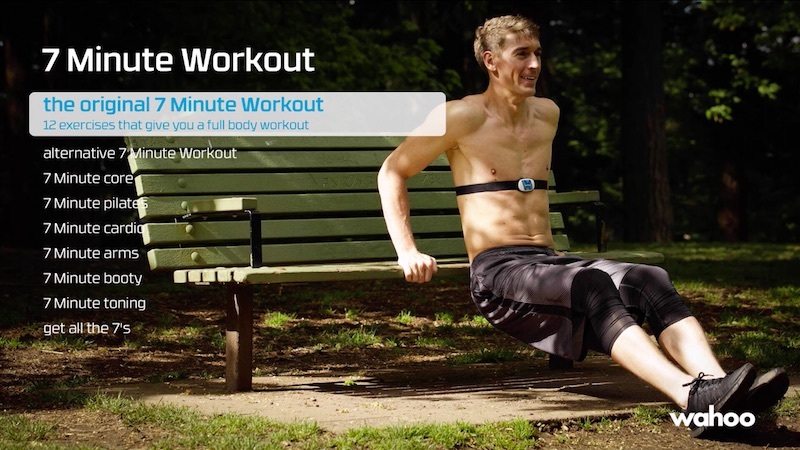 each workout for 30 seconds and rest 10 seconds. Each see video and text descriptions of each workout. Plex is an app that need no introduction. But for those who don’t know, the app let’s you create your own media server and let you watch it on a bigger screen. 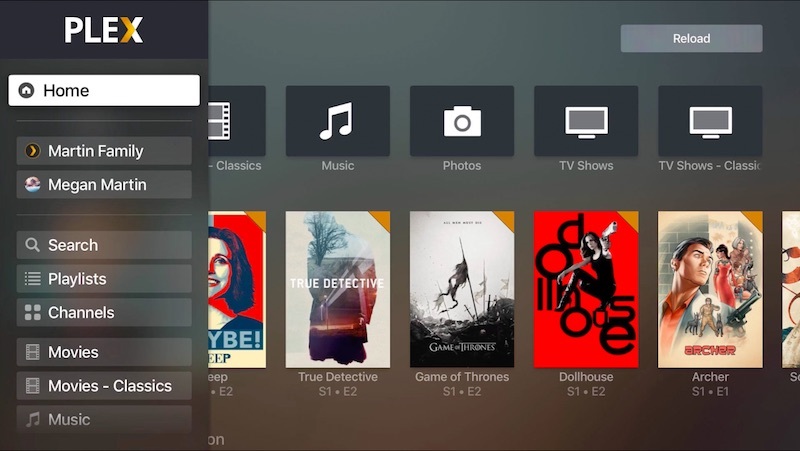 In simple English, if you have large collection of movies and TV shows that you have ripped from DVR’ed to store locally on your PC, then Plex makes it really easy to share all those high quality media from your local PC to your bigger Apple TV screen. Plex can almost any kind of media format, including AVI, WMV and more. Meaning you don’t have to go throughout he painful process of transcoding your media. Though, that’s not the only reason why Plex is so popular, one can add custom channels to Plex and watch pretty much any content from all around the world. In many ways, Infuse and Plex are a lot similar. While, I find Plex interface better than Infuse, where Infuse shines is the Dolby sound licensing, which currently not available on Plex. Also, just like Plex, InFuse is also available for your iPad and iPhone, meaning, you will be able to access all your media from all your devices by simply installing the app in each device. 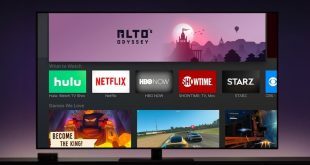 So, these were our round of best free Apple TV apps, which one are you looking forward to, let us know in the comment below.